Why line your chimney at all? from use by today’s efficient home heating appliances. 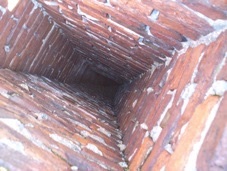 The masonry components of a chimney conduct heat. If the temperature is high - as in a chimney fire - enough heat can be transmitted through the brick or stone to ignite combustibles near the chimney - wood framing, sheetrock, lath, debris, etc. A properly installed flue liner reduces the transfer of this heat and keeps the fire in the chimney. Many insurance companies and all building codes require a properly installed lining before a chimney can be used. All fossil fuels give off toxic or irritating fumes when burned. Some (oil and gas) contain high levels of carbon monoxide and nitrous oxide which are dangerous at certain concentrations. People with respiratory problems can be sensitive to these irritants even at low levels as well as to wood smoke and coal soot. A flue liner assures that these exhausts are vented from the structure with no leakage through the casing or into the structure's walls. Chimney fires and some fuels (oil, gas, coal) can severely deteriorate a chimney after repeated use. Chimney fires dehydrate mortar so that the bond is loosened. Oil and gas "bathe" the chimney in very acidic water vapor - eating away at the interior. and stone are loosened and fall from the top. interior walls and deteriorated flue tiles. Flues can be too small (not enough draft) or too large (not enough velocity or too much air volume) to draw properly. 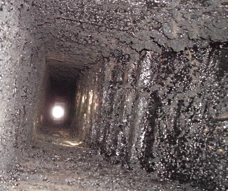 An inefficient flue often causes smoke or exhaust leakage into the structure, which can cause furnaces and stoves to consume extra fuel and can increase creosote accumulation. A properly sized and insulated flue can increase efficiency dramatically. 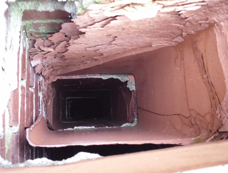 The problems associated with too small a flue are usually obvious to most people. 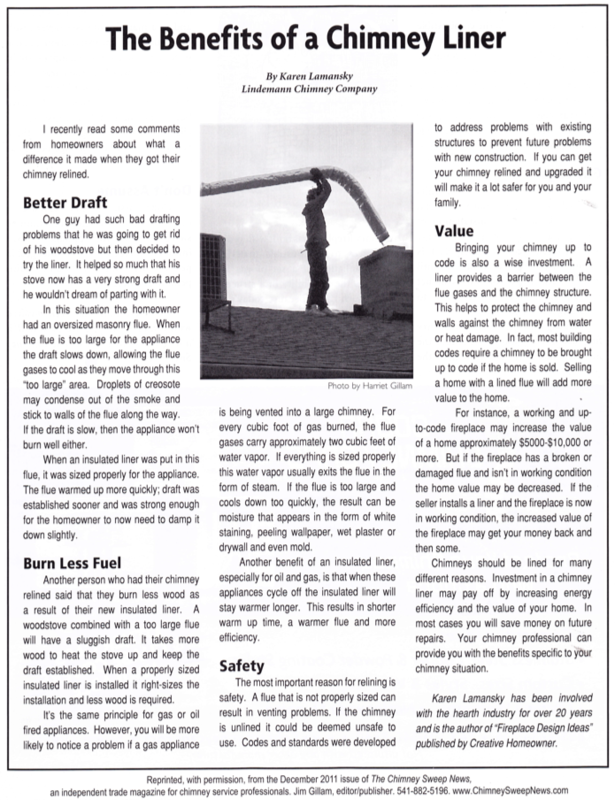 So we find that many people think that over sizing a flue is a good thing to do…WRONG!!! In heating applications (such as: furnaces, boiler and hot water heaters) an oversized flue decreases velocity which can allow poisonous flue gases to easily enter the home (also it can take the flue to long to heat up which decreases draft). In fact building codes do not allow the square area of a flue to be over seven times the square area of an appliances exhaust outlet. In fireplace applications an over sized flue will draw a high volume of room air into the flue and up the chimney then venting it to the outside, wasting heat and effectively ruining the fireplace’s operating efficiency. A round, insulated flue is the most efficient design for venting exhausts because of the way flue gases spiral in the chimney. This spiraling of flue gases in round flues eliminates the cold corners found in square and rectangle flues and allows the use of a smaller flue size which increases flue gas velocity. For instance square or rectangle flues are required to be 1/10 the size of the fireplace opening. Or, even as big as 1/8 the size of the fireplace opening, when a rectangle flue has a high aspect ratio. 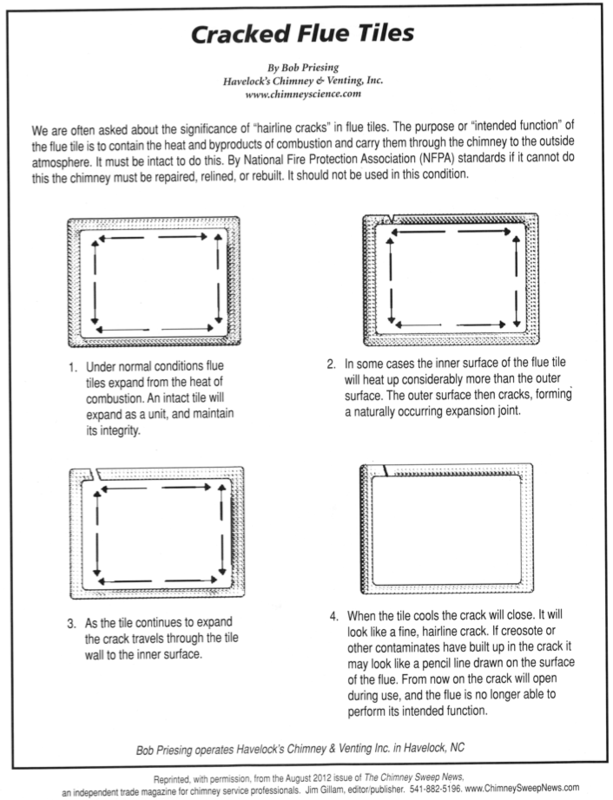 Cast in place liners only require between 1/12 and 1/18 the size of the fireplace opening for the flue size (depending upon the height of the chimney). Insulated metal round flues must always be at the 1/12 size regardless of chimney height, one reason being that metal flues heat up and cool down rapidly and are highly affected by cold outside temperatures. Unlined chimneys (and smoke chambers) are difficult to clean. 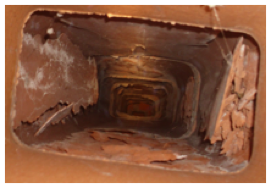 Creosote and soot are trapped in recessed mortar joints and turns in the chimney. Sweeping an unlined chimney usually does not remove all of these deposits, increasing the possibility of a future chimney fire. As chimneys deteriorate, repair costs climb. Repaired early, a chimney is far less expensive to line than one which requires substantial rebuilding first. A properly lined chimney (and smoke chamber) will minimize maintenance, allowing a brush to easily sweep it clean. Chimney fire risks are sharply reduced. A working fireplace that passes an inspection adds tremendous value to a property (especially in historic homes) and deteriorated fireplaces and furnace flues in newer homes take away a lot of value. Because we do so many inspections for home buyers we have seen many a deal fall through because of deteriorated chimney issues, remember it’s not just an aesthetic issue but more importantly a safety issue (it’s not just fire hazards that people are concerned with, but carbon monoxide and sulfur dioxide issues in deteriorated chimneys). No one wants to buy a home that has a chimney with the potential to leak toxic fumes into the house.